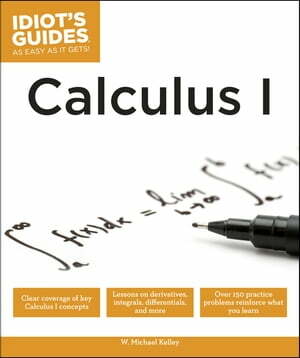 Collins Booksellers - Calculus I by W. Michael Kelley, 9781465454126. Buy this book online. Let's face it: most students don't take calculus because they find it intellectually stimulating. It's not ... at least for those who come up on the wrong side of the bell curve! There they are, minding their own business, working toward some non-science related degree, when ... BLAM! They get next semester's course schedule in the mail, and first on the list is the mother of all loathed college courses ... CALCULUS! Not to fear--Idiot's Guides: Calculus I is a curriculum-based companion book created with this audience in mind. This new edition continues the tradition of taking the sting out of calculus by adding more explanatory graphs and illustrations and doubling the number of practice problems! By the time readers are finished, they will have a solid understanding (maybe even a newfound appreciation) for this useful form of math. And with any luck, they may even be able to make sense of their textbooks and teachers.